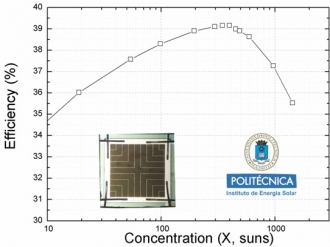 The Group of III-V Semiconductors of the Instituto de Energía Solar at Universidad Politécnica de Madrid (IES-UPM) in Spain has reported a triple-junction concentrator photovoltaic (CPV) solar cell with an efficiency of 39.2%, as confirmed by the Fraunhofer Institute for Solar Energy Systems in Freiburg, Germany. After in November 2008 reporting record dual-junction solar cell efficiency of 32.6% at 1026 suns, the research group has since focused on fabricating lattice-matched triple-junction solar cells for ultra-high concentration (1000 suns and above). The devices have an active area of 1 mm2 and consist of a gallium indium phosphide (GaInP)-based top cell (TC) with a bandgap energy of ~1.9eV, a gallium indium arsenide (GaInAs)-based middle cell (MC) with a bandgap energy of ~1.4 eV, and a germanium (Ge) bottom cell (BC) of with a bandgap energy ~0.6 eV, grown on a Ge substrate. The measured cell shows a peak efficiency of 39.2% at a concentration of 398 suns, while the efficiency is still higher than 37% at 1000 suns. The cell was manufactured using metal-organic vapour phase epitaxy (MOVPE) at IES-UPM’s facilities, and the semiconductor structure includes a high-bandgap GaInP/AlGaAs tunnel junction between the TC and the MC that is able to operate at concentrations higher than 15000 suns. Besides, the TC consists of disordered GaInP, induced by using antimony (Sb) during the epitaxial growth of the TC. The whole cell is now being optimized using proprietary software. So, in the near future, efficiencies higher than 42% are expected to be achieved at concentrations of 1000 suns.